Tuesday and Thursday 11 a.m. to 4 p.m. 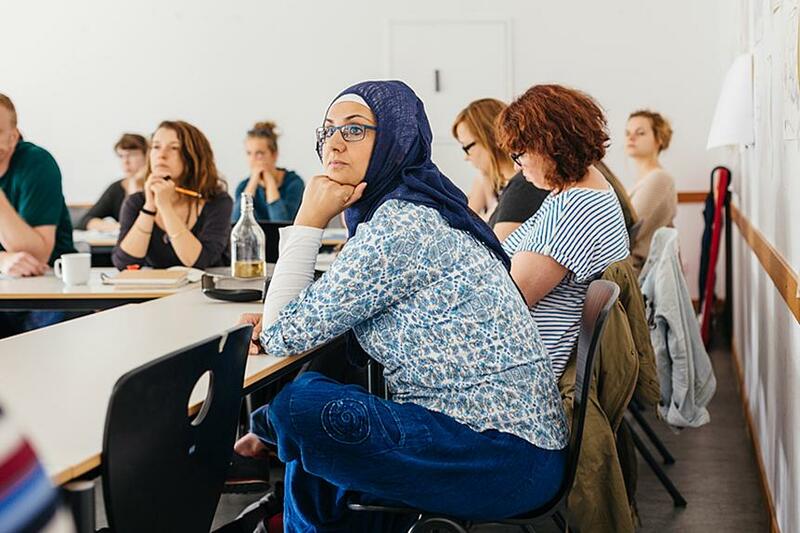 The Pre-Study Programme of the Alice Salomon University for Applied Science Berlin aims to prepare refugees who cannot apply for regular studies yet to be able to do so. The ASH Pre-Study Programme prepares refugees for regular studies in the fields of Social Work, Early Childhood Education, Healthcare and Nursing Management as well as Physiotherapy and Occupational Therapy. The ASH Pre-Study Programme enables refugees to gain all the necessary prerequisites to apply for study programmes at ASH Berlin or other German universities. Who is the ASH Pre-Study Programme for and why was it set up? The ASH Pre-Study Programme prepares refugees who are not yet able to apply for a regular study programme at ASH Berlin with the skills and necessary prerequisites for studying and enrolling as a regular student. Language skills in German can be acquired within the two-semester programme. Pre-training internships which are required for certain study programmes at ASH can also be carried out. In addition, there is the possibility to enrol on courses and gain subsequent credit during further studies. The programme is free of charge, but travel costs are not covered. There are a variety of language learning options in Berlin. We will support you with finding a language class that meets your expectations and requirements. Our service covers issues such as financing, childcare and access to online language classes by accessing an existing network of language learning options. In addition, the International Office of ASH Berlin provides licenses for free online language courses. In order to use the service, all you need is a device with which you can access the internet (smartphone, tablet, computer etc.) and an internet connection. If you are interested, please contact us at studyabroad@ avoid-unrequested-mailsash-berlin.eu. The different pathways in education and their pre-requisites are very complex. We will be happy to advise you on which options are available to you with your current apprenticeship, school or university certificates. We can establish contact between you and the relevant persons at universities, further education centres and apprenticeship offices. We also provide information about studying at ASH Berlin and opportunities for studying via the ASH Pre-Study Programme. We will support you with finding the right advice should you be in need of legal assistance. Since we do not have legal training, legal advice cannot be directly provided. However, we offer general guidance and maintain connections with the relevant advisory institutions. Having access to a broad network enables us to direct you to many different legal advisory institutions specialising in various legal fields. We can support you with gathering the documents you need to find an apartment. We are also happy to show you how to find an apartment on your own or put you in touch with people who can actively support you in your search. In addition, we can provide tips on finding a room in a shared-apartment. The services of the ASH Refugee Office are free of charge. If you are interested, need support or have questions regarding our service or the ASH Pre-Study Programme, please contact the ASH Refugee Office Team. Opening hours: Tuesday and Thursday 11 a.m. to 4 p.m.